Skillingtons have recently won by competitive tender the Main Contract for the repair of the Orangery at Wrest Park, Bedfordshire, for English Heritage. 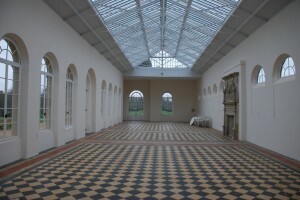 The Orangery was designed by the architect James Clephan in a French 18th century style for the De Grey family in about 1836. The facade is of ornate stucco in an early form of cement, using a combination of mouldings formed in situ and cast elements. The repairs are not only to the stucco but also to the roof (including the glass), the interior, and with the return to working order of the great north doors – where a whole bay opens up on huge hinges. This was designed to allow the wheeling in and out of orange trees, and is believed not to have been opened for around 50 years. The contract will be completed with complete internal and external redecoration, with a planned hand over date of December 2010.